The exhibition An Opera of Labour and Revolution takes an unsentimental look at the collective and its expressions both today and in the past, juxtaposing artworks based on the iconography of heroic, revolutionary gestures or collaborative, unified action. At the same time, the presented artworks also address the manifold risks of the collective such as loss of origin and identity, of self-determination and personal freedom. Creating an ambiguous balance between utopia and dystopia, the artworks each speak for themselves through their strong performative quality. Theodor W. Adorno, Hegel: Three Studies, trans. Shierry Weber Nicholsen (Cambridge, MA: MIT Press, 1993), 63. Senior Curators: Lanfranco Aceti and Susanne Jaschko. 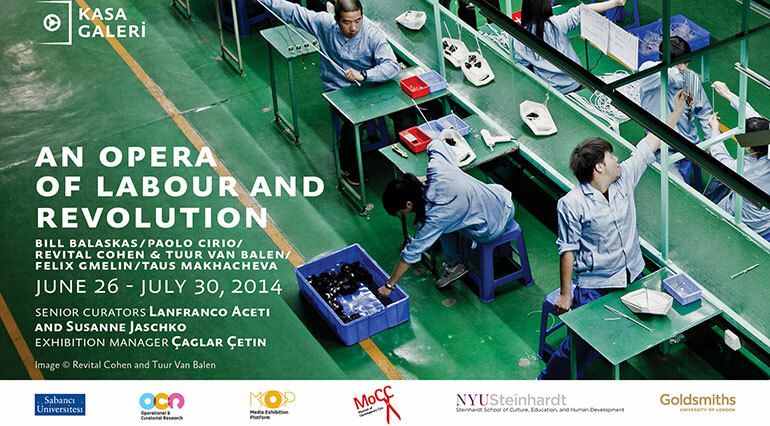 Exhibition Manager: Çağlar Çetin.Exhibition Dates: June 26 - July 30, 2014. Opening: June 26 at 5.30pm. Bill Balaskas (b. 1983, Thessaloniki, Greece) is a London-based artist working across different media. He is currently a PhD candidate in the programme of Critical Writing in Art & Design of the Royal College of Art and holds an MA (RCA) in Communication Art & Design from the same college. Also, he holds a BA (Hons) in Video Arts Production from the University for the Creative Arts and a BSc in Economics from Aristotle University of Thessaloniki. Balaskas' work has been widely exhibited internationally, in the context of more than 90 solo and group exhibitions. He has been nominated for several awards and his video works have been screened in special curated sections at Art Basel Miami Beach, Art Basel Hong Kong, Art Cologne and Art Brussels, amongst others. In 2012, he represented the UK in the London Cultural Olympiad and in Maribor, the European Capital of Culture. He has recently given public talks about his work at the University of Oxford, the11th Sharjah Biennial, Tate Liverpool, Germanisches Nationalmuseum and the Victoria & Albert Museum. The main ideas encountered in his practice are irony and the subversion of spectacle, while in the last few years his works have been strongly inluenced by the global economic crisis. Bill Balaskas is represented by Kalfayan Galleries, Athens – Thessaloniki. Paolo Cirio’s artworks have been presented and exhibited in major art institutions, including Victoria and Albert Museum, London, 2014; TENT, Rotterdam, 2014; Museum of Contemporary Art, Sydney, 2013; ZKM, Karlsruhe, 2013; CCCB, Barcelona, 2013; CCC Strozzina, Florence, 2013; Museum of Contemporary Art of Denver, 2013; MAK, Vienna, 2013; Architectural Association, London, 2013; Museum of Modern Art, Rio de Janeiro, 2012; National Fine Arts Museum, Taichung, 2012; Wywyższeni National Museum, Warsaw, 2012, SMAK, Ghent, 2010; National Museum of Contemporary Art, Athens, 2009; Courtauld Institute, London, 2009; PAN, Naples, 2008; MoCA, Tapei, 2007; Sydney Biennial, 2007; and NTT ICC, Tokyo, 2006. He has had solo shows Casa Gallery, Istanbul, Turkey, 2013; and at Aksioma | Project Space, Ljubljana, Slovenia, 2011 and 2013. Cirio has also curated panel series at the Kitchen, NYC, 2012 and Eyebeam, NYC, 2013. He has won a number of awards, including Golden Nica at Ars Electronica, Transmediale and the Eyebeam fellowship, among others. He was born in Turin, Italy in 1979 and currently lives in NYC. Revital Cohen and Tuur Van Balen’s work is occupied with broad meanings of material and production. They work across objects, installation, video and photography to explore the idea of manufacturing as a cultural, ethical and political process. Their practice experiments with the use of design as an artistic medium, drawing on tensions between biology and technology. Inspired by the idea of the technological material, they create artificial minerals, unnatural animals and poetic machines. Born in Heidelberg, Germany, Felix Gmelin lives and works in between Sarajevo and Stockholm. Solo exhibition venues include Stacion - Center for Contemporary Art Prishtina, Kosovo (2011), Portikus, Frankfurt and Malmö Konstmuseum, Malmö (both 2005). Gmelin’s work has been featured in prominent group exhibitions including Cartier, Paris (2011), Les Jacobins, Le Printemps de Septembre, Toulouse (2010), The Power Plant, Toronto (2008), Statens Museum for Kunst, Copenhagen (2008), KW Institute for Contemporary Art, Berlin and Hartware MedienKunstVerein at Phoenix Halle Dortmund, Germany (2007-2008), La 52 Biennale di Venezia, Arsenale, Venice, curated by Robert Storr (2007), Of Mice and Men, Berlin Biennial 4, Berlin, curated by Maurizio Cattelan, Massimiliano Gioni and Ali Subotnick (2006), The Moderna Exhibition 2006, Moderna Museet, Stockholm, (2006), MASS MoCA, North Adams, Massachusetts, USA (2006) and Delays and Revolutions, La 50 Biennale di Venezia, Italian Pavillion, Venice, curated by Francesco Bonami and Daniel Birnbaum (2003). Taus Makhacheva (b. 1983, Moscow) – winner of “Future of Europe” prize (Museum of Contemporary art, Leipzig, 2014); “Innovation” prize (2012) holds a BA in Fine Art from Goldsmiths College (London, 2007) and an MA from Royal College of Art (London, 2013). Selected exhibitions: 7th Liverpool Biennial: City States-Makhachkala, Topography of Masculinity (2012); 11 Sharjah Biennial (2013); Love me, Love me not, 55 Venice Biennial, collateral event (2013); Story Demands to be Continued, Makhachkala (2013); Walk, A Dance, A Ritual, Museum of Contemporary Art, Leipzig (2014).